The Pizza business is huge! There are several good ones, especially in St Louis, MO. 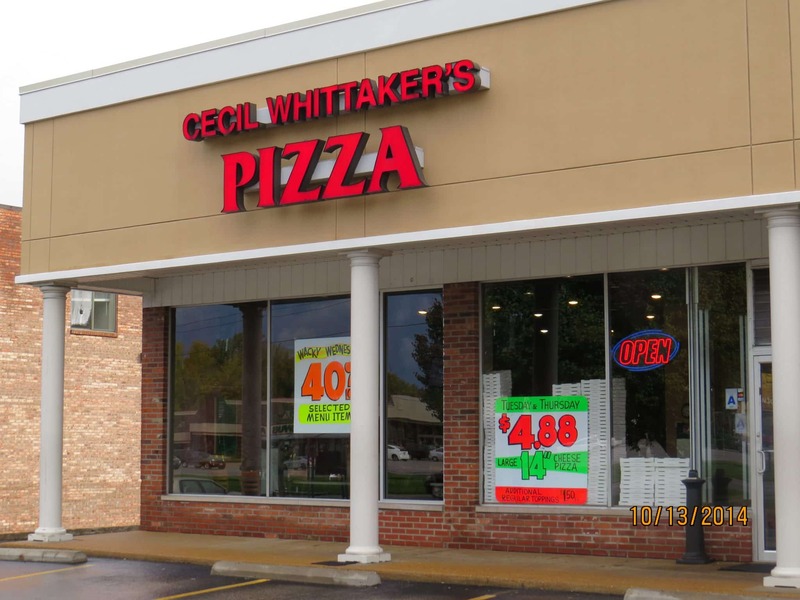 However, we have grown fond of a locally owned Pizza franchise Cecil Whittaker’s Pizza Restaurant. They are locally owned by Donald Glenn, but certainly not new to the scene. They have been in business since 1983. Cecil Whittaker’s Pizza provides one of the best values especially when you take into consideration the most important characteristic of a Pizza, the quality and amount of toppings. I have been eating at the Cecil Whittaker’s in Ballwin on Manchester for almost 3 years now and the price is always great as well as the food. I am a meat lover’s type of guy and they load it with your favorite toppings. Their menu is much larger than most pizzeria’s offering pastas, salads, chicken wings, beer and sandwiches including burgers. Cecil’s burger is one of the best that I’ve had as well. ½ lb charbroiled to perfection. I was reluctant to eat a hamburger in a pizzeria, but it was worth it. They have a great selection. While they are a pizzeria, they have something for almost everybody that you will enjoy at a price that is more than fair. We typically offer other review ratings, but that is difficult here because urbanspoon has so many different listings. It appears that there is a different page for each location. The ratings are high with some topping out at 91%. They have active Facebook and Twitter pages. There is a Facebook page for each store, which is nice. The corporate Facebook page has 4.7 stars. Nice job! Yelp gives them a 4 star. Additionally, they offer a VIP Rewards Program that is well worth the time it takes for you to sign up. There are 3 company owned stores and the others are franchise stores, therefore, as is always the case, the quality and special offers may vary slightly. Please visit their website for information about their all locations or for information about a franchise. St Louis Restaurant Review recommends Cecil Whittaker’s Pizza and gives it a 4 Star Rating. They offer a good family atmosphere and good food at a good price. It is clean and the service is always excellent. FREE PIZZA CHALLENGE – Cecil Whittaker’s Pizza Restaurant at 15338 Manchester Rd,Ellisville, MO is starting a campaign that we are going to have some fun with. Scott Moore, the manager, is willing to give away a FREE 14” single topping pizza everyday to a single chosen contestant to see how many days in a row they can eat a pizza. Drinks, salads and sides are not included. The rules are that the challenger must eat the entire pizza without help and that it has to be every consecutive day. If you miss a day, you’re out and they move on to the next contestant. The record holder will get a framed photo mounted in the restaurant for their accomplishment until another challenger breaks their record. We appreciate being involved in this challenge. Please submit your name & contact information to [email protected] On July 15th we will announce who the first lucky challenger shall be. Good luck! This blog post is unbiased & is NOT paid advertisement by Cecil Whittaker’s Pizza. The original post was published June 30, 2014. Cecil Whittaker’s Pizza may withdraw this offer at anytime for whatever reasons. Additionally, when this post was originally published there were 25 stores. We are not sure how many exist now because we know that new franchises have been sold. We will update this information and republish the post within the next few weeks.